Syncing content will store and automatically update content to your device. Once a folder is set to syncing, any new media added by your admin will automatically sync when your device goes online. Locate the file you wish to sync, swipe left and click download. This will now take you to the Sync Content screen. Navigate to the content you wish to sync and tap the circles beside the folders to select them to sync. Alternatively, to sync all folders within your account, click the Select All button at the bottom of the Sync Content screen. To start the sync process, click the Sync button on the top right-hand corner. From the Zunos Dashboard screen, tap the cog on the top left hand corner. Tap Sync Content in the menu that appears. In the Sync Content page, once a download is triggered a status area indicates updates in progress. 2. Tap this area which displays 'Checking for files...' to take you to the sync downloads page, this will show you what content items are in the order to be synced. 3. 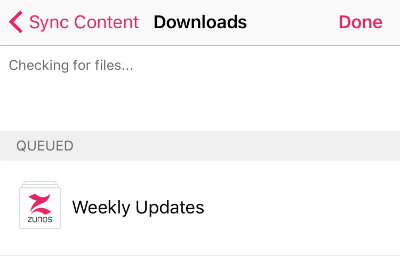 Once the downloads are complete, a 'files synced' notice will appear. In the Downloads section, it will display 'All downloads complete'. Blue Dots: Indicates that new content is available in the folder to view. 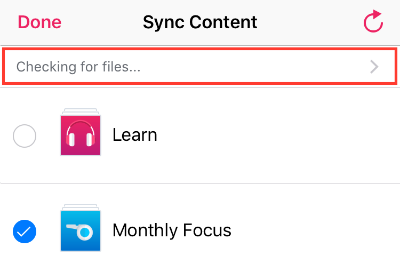 If you have followed the steps above to sync your content/folder, a ‘synced’ message should display indicating the folder/file is updated. If the file has not been synced you will have a ‘download’ option display. If you want to remove a download file from the device a ‘remove’ option display. Files which are not downloaded to the device will display a 'cloud and down arrow', tapping on this button will download the file to your device. To remove the file from your device, swiping left will reveal a ‘remove’ option, tap this to remove the file.